The Renova Asphalt Recycler. The Last Recycler You Will Ever Need. Make Permanent Repairs More Economically. Eliminate Waste and Work Even In Winter. The RENOVA is a self-contained, easy to operate, versatile, mobile machine that produces hot mix asphalt on site from reclaimed asphalt pavement extracted directly from the repair area itself or your stockpiled millings. The RENOVA also accepts large chunks of old pavement eliminating the need of costly asphalt from the hot mix asphalt plant. The process includes the addition of a proprietary rejuvenant which improves the performance of the entire repaired area. The new asphalt will actually outlast the surrounding asphalt! The RENOVA is appropriate for patching potholes, utility patches and other small asphalt repairs year round regardless of the outside temperature. By eliminating the need for using cold patch or a hot mix asphalt plant, the savings you will gain will pay for the machine quickly as you recycle old pavement and patch the area with secure asphalt patch. The RENOVA provides an easy to use, economical recycling process. The contractor can produce a more durable, longer-lasting, superior quality asphalt material at the repair site in the exact quantity needed; with no waste. 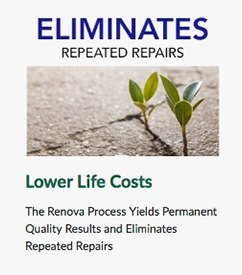 Using the RENOVA yields quality results with lower costs. Not only is it the smarter choice but it’s the right choice. Call us today for more information on the RENOVA. Self-Contained Unit Mounted on a steel 18 Foot Dual-Axle Frame Pull Trailer. Specially designed hardened steel heating drum provides maximum heat and mixing. 26 HP Diesel Engine with Generator. Burner, Self-loading Hopper & Drum on Hydraulic Tilt Lifts. Dust & Heat Flow Stack. Electrical outlet (120V) to run accessory equipment. Vibratory Compactor Roller Unit (Optional). Equipment and Product Made in USA. Why is the Renova Asphalt Recycling Machine the Best Choice? The RENOVA is twice as fast as the competition and has 3 times the capacity. Get your work done in a 3rd of the time. The RENOVA can produce up to 2 tons of recycled hot mix asphalt per cycle in about 10 minutes or around 10 tons per hour. A premium quality hot asphalt paving mix, better than new, is produced by the RENOVA with the addition of our proprietary “eco-friendly” rejuvenant made of asphalt cement modified with crumb rubber, creating a permanent repair and eliminating the expense of repeated work. Less expensive than conventional asphalt from the local plant or any other product currently on the market, the RENOVA can produce a more durable, longer-lasting, superior quality asphalt material at the repair site in the exact quantity needed. RENOVA is the leader in innovative asphalt pavement repair and recycling. With its national headquarters in Charlotte, NC, RENOVA provides asphalt repair equipment and solutions that save time and money. 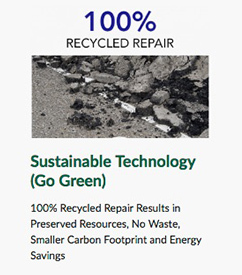 Existing old damaged asphalt pavement is 100% recyclable, and with the RENOVA Industries asphalt pavement recycling machine, it can be re-processed on site into reusable hot asphalt mix. Use of the patented RENOVA Process is efficient, saves you money, and preserves the environment and our natural resources. It is the sustainable solution for making asphalt pavement repairs, and it is available to businesses nation wide. HOW IS RECYCLING ASPHALT ONSITE POSSIBLE? A repair that is more easily compacted, preventing the penetration of moisture. Don’t let conventional pavers haul away your valuable old pavement, replacing it with expensive asphalt mix from the asphalt plant. Your old pavement is 100% recyclable with the RENOVA. Allow us to re-use your existing materials and avoid the waste and expense of the conventional repair with virgin materials in new replacement asphalt. The savings will approach 30%. 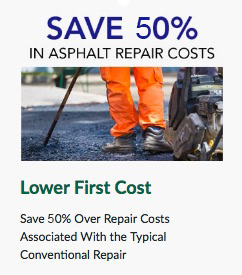 Call Charlotte, NC based RENOVA Industries today to see how we can help you save money on your next asphalt repair. The RENOVA is one-of-a-kind in the asphalt recycling industry and it is available for purchase. You can own one of these cutting edge machines today and trust that it will get the job done while saving you money and protecting our environment. Call us today to get more information on your new RENOVA.